The Gavia is frequently included in the Giro d’Italia – as Cima Coppi if the Stelvio or Agnel are not in it too – and it is legendary for the stage victory of Erik Breukink in 1988 and the infamous ‘bus ride’ by Johan van der Velde during that same stage. With an altitude of 2,621m, it’s ranked 5th in the list of highest paved passes in Europe, if the Galibier is ranked without the loop over the tunnel. You would do well to inform yourself about the weather conditions, specifically higher up the mountain. Even with good weather in the valley, it’s not uncommon that the weather in the upper half of the climb is less comfortable – at the very least, it will almost always be chilly and windy. 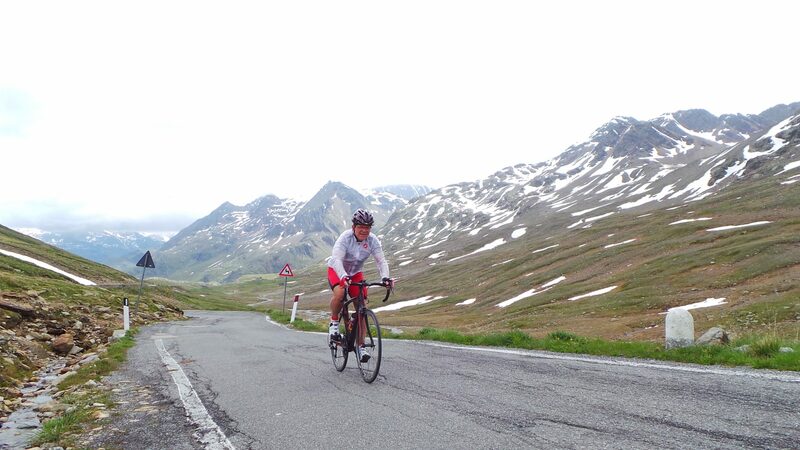 Climbing the Gavia is part of several Gran Fondos, riding a “round trip” including the Mortirolo. Clockwise from Bormio this means the Gavia first and then the Mortirolo from Monno; counterclockwise it involves the Mortirolo from Mazzo and then the Gavia from Ponte di Legno, arguably a much more difficult course. Report from 2011’s trip up this end here. 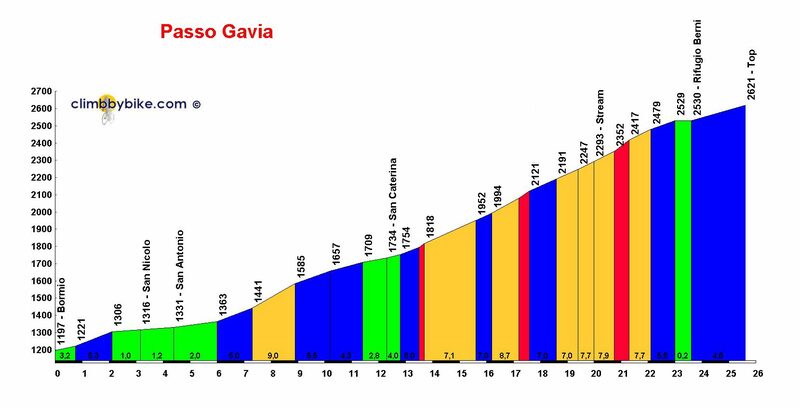 Report of stage 9 from 2015’s Giro, when I climbed both sides consecutively here. To Santa Caterina Valfurva, the ascend is not too difficult – some steeper sections, but overall not that hard. From there the more interesting and beautiful part of the climb starts – some 13.5 kilometers, with almost 900 altimeters. 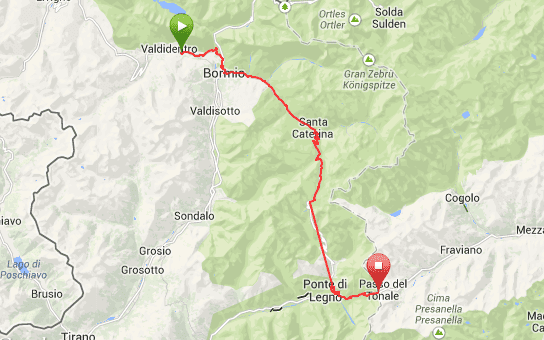 The final part towards the summit can be – just like the Stelvio from Bormio – a challenging effort, perhaps not as far as grades are concerned, but more so when it’s cold and you’re battling a stinging head wind. And some 3 kilometers from the summit, you will go through an unlit tunnel / gallery – you will pass through it a lot faster than when climbing up (from) the other side, but it’s scary and you may want to use your bike lights nonetheless. Report of my 2011 trip up this side here. Report of stage 9 from 2015’s Giro, when I climbed both sides consecutively, here. 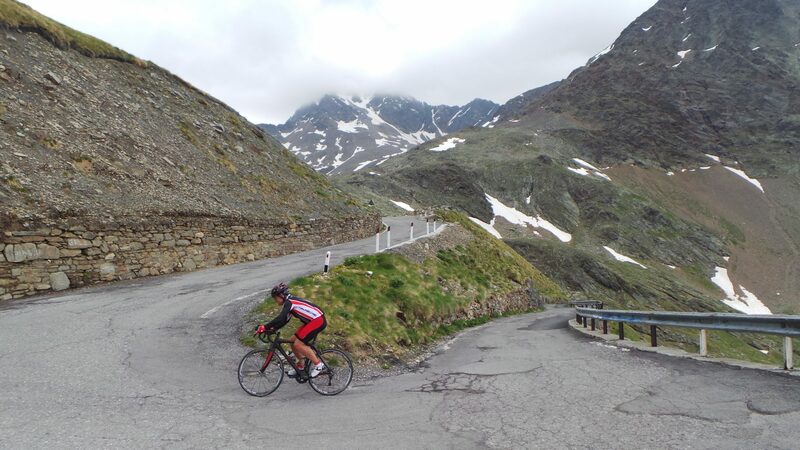 From Ponte di Legno, the tougher climb of the Gavia awaits you – shorter than from Bormio, but with nearly 1,500 altimeters over a distance of some 17.5 kilometers, definitely more challenging. You can use the first few kilometers to warm up, but from thereon you do not get a lot of easy stretches. By far the most difficult part is the passage through the woods, where the grades increase up to 16%. But also after that – and certainly in the often cold and windy upper part – you hardly ever get the chance to catch your breath. The final 3 – 3,5 kilometers will offer you the best views – be careful enjoying those, because the road is narrow and the quality of the surface is (very) poor. 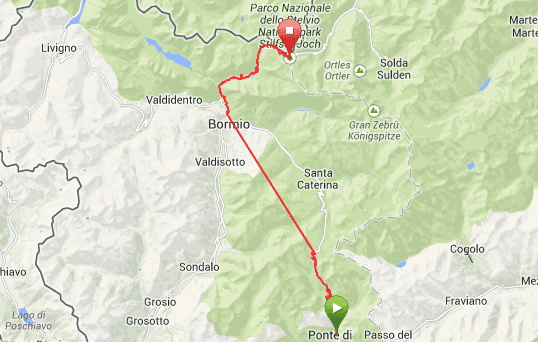 For the first time during this (cycling) holiday, the rain spoiled (half) the trip and C. was forced to postpone the climb of the Gavia from Ponte di Legno.